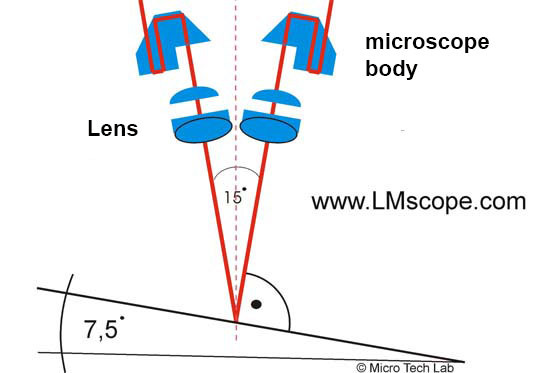 Are normal stereo microscopes suitable for high-quality photographic documentation? 95% of all stereo microscopes are designed either according to the Greenough principle or the telescope principle (Abbe principle). They deliver good to very good results on visual inspection. If, however, digital camera equipment is mounted onto a conventional stereo microscope, more often than not the quality of the images is disappointing. Especially in the case of the Greenough principle, the difference between the visual perception of the image quality and the image itself is particularly pronounced. How does such a difference arise? Is the human eye superior to the camera? To answer this question we need to go into more detail. 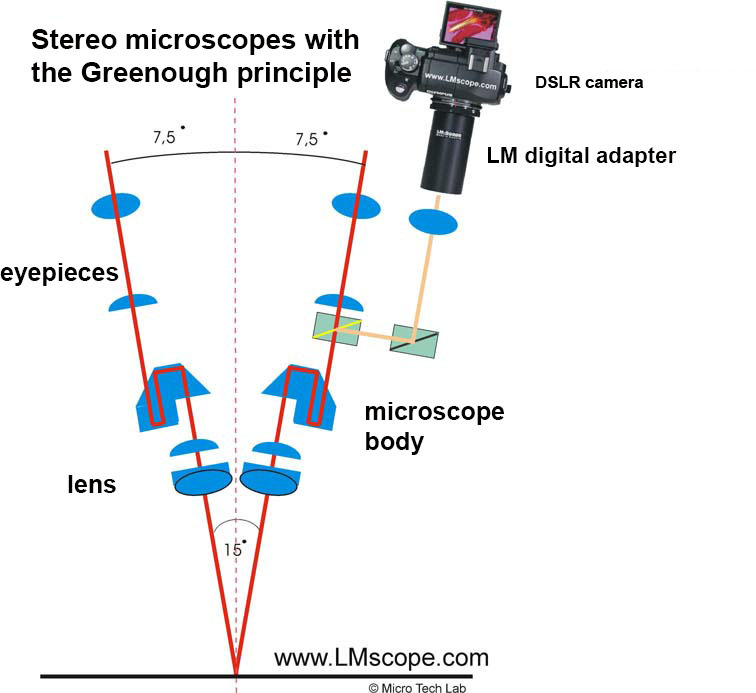 Greenough-type stereo microscopes have two completely separate optical paths. They strike the object with a difference in angle of 15º, which is created by two lenses situated in a common mount. The human brain is able to generate a three-dimensional image through the optical path and the angular offset. If you close one eye and look again through the microscope, you can see that only the centre of the image is optimally focussed. To the left and right of the centre, the image is either under- or overfocussed – in other words, there is a marked fuzziness. This effect is especially evident with planar objects, such as histological sections, geological stone sections or flat electronic components. The larger the optical path angle, the stronger the described effect. Optical systems have only a limited depth of field as a result of their physical characteristics. With Greenough stereo microscopes, structures are only depicted with optimum focus over a narrow area. This area shrinks with increasing magnification of the microscope. As the rays always hit the object at a fixed angle of 15º, there is always a sharpness gradient over the entire image field. The image quality of the photographic documentation of planar objects can be improved by using a simple trick: The angular offset can be balanced out by tilting the object plane by 7.5°. This should cause the sample to be positioned at right angles to the optical path. “Telescope style” (Abbe principle) stereo microscopes are more flexible than the Greenough-type microscopes described above. With this design there is no double lens; instead, the microscope has only one lens with a large diameter through which the optical paths run for both the left and the right eye. There is no real three-dimensional impression upon visual inspection through the common main lens, as there is with the Greenough instruments. This is particularly disadvantageous when working under the microscope, e.g. with specimens. The flaw in this system lies in the course of the optical path into the lens. 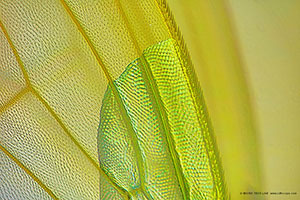 As only one common lens is used, the lens edge must be used to generate the image. The intermediate image is at an infinite distance. The central, high-quality area of the lens unfortunately remains unused. However, due to its physical characteristics, the central part of the lens exhibits fewer optical errors than its edge. In photographic documentation, only a moderate image quality is achieved; nevertheless, this kind of microscope is better suited to microphotography than the Greenough microscope. 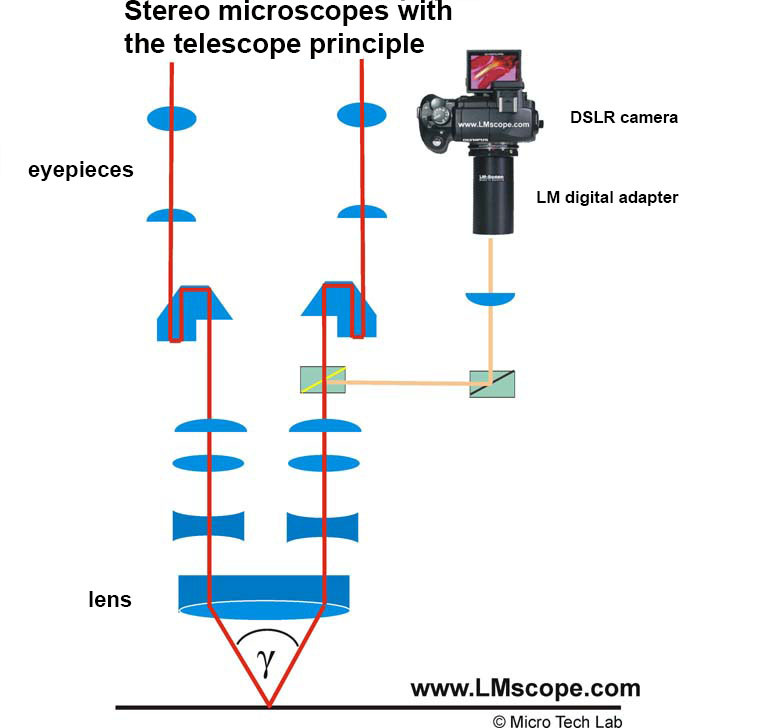 Conclusion: Stereo microscopes designed according to the more expensive telescope principle are indeed better suited than Greenough microscopes for high-level photographic documentation with film or digital cameras, but they, too, do not deliver optimum results. 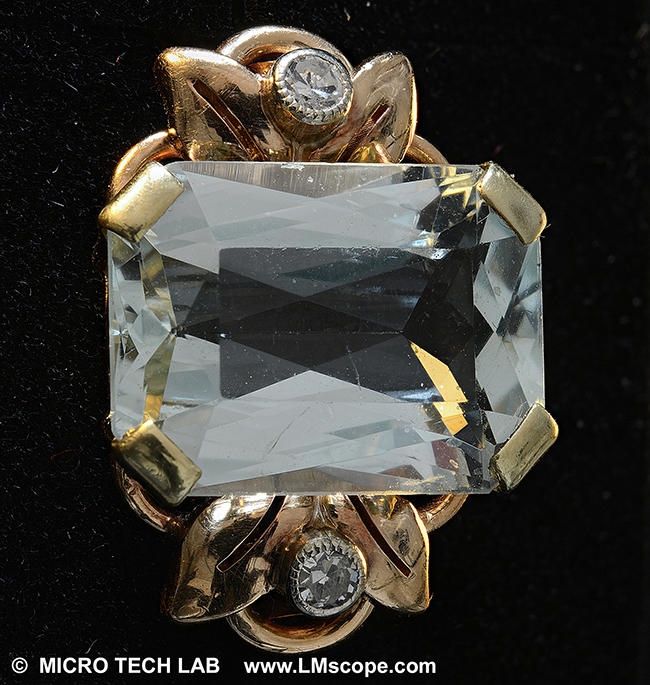 All major manufacturers offer specific solutions for micro and macro photography. These instruments, however, tend to fall into the higher price bracket, starting from € 10,000. The LM macroscopes with parallax-free, centric optical path and high-quality precision optics are replacing all conventional stereomicroscopes with parallel, non-centric optical paths in photographic documentation.